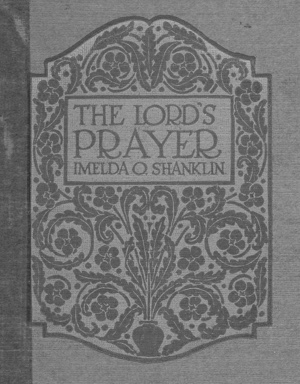 Imelda Shanklin: What Are You? CONSCIOUSNESS is indicated by words. Every thought contains a word that holds the kernel of the thought. The mental experiences involved in such a thought as the foregoing, are more objective in character than are those experiences involved in a statement of spiritual fact. But they are no more real or effective. In the one instance, there is pictured a change of relationship to visible things. In the other instance, there is a change of relationship to the external facts of eternal existence. In the first case, there is an adjustment of the physical-spiritual to an existent, more or less unfamiliar physical condition. In the second case, there is an adjustment of the mental-spiritual to to an existent, more or less unfamiliar spiritual condition. We mentally affirm, “I Am health.” I Am is the consciousness which does not need to recognize itself; but it must be identified with what we wish to experience. Therefore, in this instance, health is the kernel of the thought. The process of association by which, in the first instance, we mentally drew into the midst of scenic splendor, now draws us into intimate association with the spiritual verity of health, and we take on the characteristics of health in bodily vigor, abounding spirits, harmony of coloring, and symmetry of outlines. We can so train our minds that we shall be in constant accord with the divinest truths of God. The attainment of such relationship is the object of the study which we are giving to spiritual realities. The adjustment desired is brought to pass by dwelling in words. We are not all in precisely the same stage of unfoldment, so that one of us may need a specific word while another one of us may need another specific word. In our individual drills, we choose a word that embodies the characteristic which it is needful for us to develop at the time. The omniscient mind of God will give us the individual word. If we have made a mistake, Judgment should be dwelt in. If we have condemned any one or anything, Forgiveness should be our habitation. Wherever we see an absence of Godlikeness, we are being reminded by the omniscient mind of God that we are to inhabit the opposite, redeeming word, until we have brought the idea embodied by the word, up to the level of our development. There are some words that are universal in their beneficence. In these we can all unite. The relation we give to our words, has as much to do with the righteousness of our speech as does the character of each word itself. Blasphemy is a linking of the sacred name to profane situations. Worship is a linking of the sacred name to reverential uses. Worship anchors the soul to peace and wraps the worshipper about with safety. The central purpose of worship is to bring us into association with God ; to make habitual our association with God. That we may make habitual our association with him, we dwell in the spirit of prayer. After we have established a conscious association with God, we become convinced that the individual need is the universal need. Then we ask how all souls can become Christ quickened, and we dedicate our spiritual strength and integrity to the work of bringing mankind to the divine consciousness. No better outline for such work can be found than that which may be constructed from the Lord’s Prayer, for in it Jesus Christ has compassed the whole need of man from his going forth from Eden unto his return thereto. All that we can do for ourselves, all that we can do for another, is contained in this instruction given by the Master to his students. A l l of physical supply is pointed out. All of protection is made clear. All of reverence, praise, adoration from the Son to the Father, all consecration, all hope, all triumph, await those who can go into its words and abide until the spirit of the Prayer has baptized them with its own understanding. In this opening phrase of the Lord’s Prayer, the mind instinctively emphasizes Father, and gives a secondary emphasis to heaven. A third word should be considered of importance, also. This word is, our. The relative value of the words is indicated by this arrangement: Our FATHER who art in HEAVEN. When in his Galilean experience, Jesus Christ preached to a social order in which the masculine element was considered more important than the feminine. The patriarchal system prevailed. The man was paramount. The religion of the Jews featured the Deity in its masculine qualities, and the Great Teacher spoke to his countrymen in terms which would make the most direct appeal. Hence he spoke of God as being the Father. This word was understood by all his hearers, and it has given an interpretation of the Deity which the homesick sons and daughters of God have yearned for since the beginning of time. Father. When we take this synonym for God into the inner chambers of the soul, there is flashed upon it the religious light which gives it an aspect of an immutable, eternal, omnipotent God, the majestic Father Principle, which begets expression. But after we have faced this nature of the word, and have wrested from understanding an assurance that the awful sublimity of God as Creator is only one characteristic of our Father, we come to the heart of Jesus Christ’s meaning. Here we see and know and feel, the tenderly compassionate Father, who broods over us in a yearning love that transmutes our willfulness and our mistakes into obedient righteousness. He gives himself for us and to us; He carries us in the arms of his unfailing purposes of good, when the way is too rough for us. He provides for all our needs, and takes no account of our shortcomings. He loves us with a devotion incomprehensibly sweet and true, and forever beyond our power of thwarting or disappointing. Such is the Father, and he is inconceivably more than this. Heaven. This is the word into which we crowd all the intense desires of the soul. It is the realm of unexplored beauty and goodness that presses upon us for an outlet. It is the place of supreme happiness. It is the abode of God and his angels, the Father’s house where we are his beloved children. Its ecstatic joys flow upward into consciousness from hidden deeps, where the heaven of heavens exists. Heaven is the spiritual consciousness by which we come into an inseparable union with God the supreme Creator, and God the companionable Father. “The kingdom of God is within you.” All the glory, sublimity, dominion, and all the love, beauty, gentleness, of God are within us. But deeply within; so deeply within that aeons of dwelling in this thought will not bring us to its profoundest revelations. Our. Jesus Christ spoke of God as “your Father and my Father,” or as “our Father.” When in the sanctuary of private worship, he addressed Him as, “my Father.” In a general discourse to numbers of listeners, he spoke of Him as “the Father.” In the Prayer which is for the whole race, the address is, “our Father.” The universality of the Father is the life germ of Christianity. Other religions celebrate mighty gods; remorseless gods; pulseless gods; exclusive gods. But the God of Jesus Christ is the forgiving, thoughtful, loving Father of all. He is our Father. When we have learned the meaning of this initial thought of the Great Prayer, we have prepared ourselves for an entrance into the illimitable fields of the Jesus Christ fellowship, which are contained in the whole address. First, we train ourselves to know the nature of our Father; this makes us able to receive him. Second, by consistently thinking of him as dwelling within consciousness, we feel his presence, and so we are in heaven with him. Third, we experience an infinite expansion of being, through the established understanding that he is our Father. Our hearts beat with the pulse of the great heart of God. The Father reigns from his throne within. He withholds nothing, we withhold nothing. The nature of the original creation is very clear to us; it comforts, it inspires, it assures us of our inseparable oneness with the mighty God who is also the humble God—OUR FATHER who art in HEAVEN. The Lord’s Prayer is composed of several prayers, each one distinct and complete, each one providing ample salvation for the soul that will make it his spiritual creed and inspiration. The name indicates the character. A brief analysis of two words that have common usage, will give an illustration of name characteristics. The word food suggests bodily comfort, nourishment, survival. Contrast this word with hunger, and the gaunt discomfort mentally portrayed by the latter throws the word food into a prominence that our casual use does not convey to consciousness. In designating God as Father, Jesus Christ presents the most awe-inspiring fact of being, the absolutely relentless force of creation, under a synonym for protective gentleness. He transmutes the omnipotent God of Genesis into the tender parent. He strips the stern Jehovah of his imperious mask and discloses a countenance arrayed in the patient smiles of a comprehensible relationship. The Hebrews inculcated in their children a respect for parents which is rather too little observed in families where modern ideas of family life prevail. It was an innovation to speak so intimately of God as Father, but the speaker knew that once the relationship became established in their thoughts, “Hallowed be thy name,” would be more than a form of words. The inevitable reaction in the minds of his hearers would be one of an interested intimacy, presenting God as loving counselor and as almighty protector. The secret of any word may be learned through prayerful absorption of that word. When the mind expands toward the word Cod, in a way similar to that in which the heart opens to receive blood, we come into the very center of the Father name of God, and so apprehend his dearest nature, as did Jesus Christ. A true understanding of the name of God, baptizes us into a realization of what the Father is, and what he means to us. An unutterable reverence filters through the mind, stilling our souls into a rapture of adoration. There is the close-wrapping of an infinite devotion, a blending of the individual with the divine cosmic. Upon the thread of our humanity there is woven the golden strand of his majesty, his purity, his sweetness. The heart of the worshiper melts into the Father-heart. The name becomes sacred; its utterance in the hushed corridors of the soul is a sacrament of ineffable bliss. The name, as the receptacle of the Father, is inviolable in word and in thought. It becomes the arcanum of life, and the innermost shrine of worship in the temple of life. As the significance of Father clarifies in our minds, we pass from watchful speech to watchful thought concerning it. God cannot hold that one guiltless who lightly takes the Name of names. The Name is almighty; less than supreme reverence for it, is profanity, for which amends must be made. The Name is the sanctity of all being, and it will distill into the prayerful soul the true significance of its own nature. Therefore, to increase within ourselves the understanding and the condition of true reverence, we pray. In the initial zone of prayer, the zone of blended time and materiality, we can pray for concrete good. After that stage is passed, we enter the plane where prayer is a yearning of the heart for abstract good. Having traversed this land, we come to a place in which we experience a definiteness of need; here we know that the final nature of prayer is not a personal request, but a longing to attain a consciousness of that which we have named God. When we reach the courts of God’s habitation, relativity is abrogated, and we are absorbed by the thought of the Deity, of whom no ambitions and no limitations can be supposed. Whatever may have been our early desires, with whatever need we may have set out upon the journey of prayer, nothing remains save that germ of all prayer to God— aspiration to know our likeness to him. The soul increases its spiritual dimensions through the exercise of devotional prayer. We draw near to that for which we pray. We take on the characteristics of the power to which we pray. Jesus Christ addressed his prayer to the Father in heaven, then he prayed that the kingdom of the Father should come. To pray with Jesus Christ, is to use the same soul exercise that he used. By this means we grow into his dimensions. To pray is not to supplicate. To pray is not to arrogate. Whatever may have been the mistake of the soul in the past in the respect of prayer by entreaty, it is certainly more fitting that we should be humble before the great God than that we should be presumptuous. Entreaty may not deliver us an immediate answer to prayer, but it keeps us mindful of God’s omnipotency. Command may compel the outer shell of demonstration, but it creates a fearful hollowness within. Lucifer instituted hell by his willfulness. Jesus Christ shows us the way into the kingdom through a modest, though intense yearning toward the Father. To pray that the kingdom of the Father may come, is to pray that the conditions of heaven may supplant the conditions of earth. If we have given up selfishness, we can make this prayer. If we make reservations, our desires will clamp fetters upon it, though lip and tongue and voice give it expression daily. We do not really pray unless the soul reaches toward something higher, purer than it has apprehended in the past. All aside from this is controversy and self-importance. God is the royal Father, the King of the universe. The Father is in heaven; his kingdom is heaven, the place of the most exalted. Praying for the coming of the kingdom is praying for the coming of the inconceivably glorious; it is praying for the revelation of the highest, which immeasurably overtops our present known or suspected highest. The answer to the prayer comes through the unrolling in consciousness of the highest we now surmise, and after that, the highest which that highest discloses, and so on indefinitely. If we really pray this prayer, we pray that we may be stripped of mortality and arrayed in the unaging robe of immortality; that the personal shall vanish; that the impersonal shall appear; that choice shall never attach to the concrete, but that it shall be satisfied with the abstract. Such is the order of spiritual evolution. The soul has come up from the level of primitive humanity, ascending to successively elevated tablelands of mental-spiritual outlook, seeking the kingdom. Beyond our present stage of development shall appear a humanity which we now call super, just as millions of years ago the eye of prophetic vision would have seen the superrace in the humanity of our day. Our perceptions of the ultimate kingdom are increasing, because our minds are being clarified. This is the coming of the kingdom. The kingdoms of earth are adumbrations of “Thy kingdom.” Peace—liberty—nation Christ-brother to nation—is the vision of those individuals and peoples in this day who know the overkingdom of God to be the pattern for all governments. Having received the revelations of God immanent, we shall attain his peace unspeakable, his love supreme. To make ourselves citizens of that land which is the abode of God and of his angels, to quicken the souls of all men to a like responsiveness, we pray. As employed in reference to the mind of God, the word will, holds the total of the Father’s idea for you and for me. It is the veil that sheathes the splendors of Divine Life, toning its radiancy to the comprehension of the physical. When we let consciousness come under the words Thy Will, we find ourselves occupying the center, of vast outlooks, of infinite tenderness, of immutable goodness. Thy Will so transcends will, that we are glad to surrender the short aims that act within the restricted area of the personal. By meditation we can learn the will of the Father for each day’s guidance. Let us say slowly, reverently, rejoicingly. Thy Will; Thy Will. If we feel the need for so doing, we should take the words into silence. In this exercise, we first speak mentally, giving clear attention to the significance of the phrase. From this drill, we let the consciousness of words glide into the consciousness of God’s Spirit in the words. This is prayer, sacrament, identification with the Father. Such prayer as this gives us a perception of Thy WILL which makes qualifications unnecessary. The will of the Father flashes upon us enough of its character to still each question as to ways and results. We know beyond any possibility of forgetting, that Thy Will has no connection with suffering. We shall nevermore think that it has preferences for one person. We shall distinctly feel its peculiar benediction and its heart of rest for those who seek it. We shall be able to pray. Thy Will be done, with an assurance that we are invoking graces which issue so deeply within the unmanifest, that in time to come, they shall dawn upon our lives as a great and hitherto unsuspected sun is revealed to the astronomer who sets up a many times more powerful telescope than he has used before. We nevermore pray that our wills may be done. We do not trick ourselves into believing that a matter which is our wills for us must necessarily be God’s will for us. We can serenely see the desired good go to another; Thy Will holds our blessing, richer than we have imagined. With equanimity we face each change, for (having prayed) Thy Kingdom is entering, through whatever gate Thy Will chooses. We cease to have wills separate, even as we have ceased to have loves separate, lives separate. The range of the Lord’s Prayer makes it absolutely sufficient to all human needs. The world is not yet able to pray as Jesus Christ prayed, according to the seventeenth chapter of John. But it should use the Lord’s Prayer as a preparation for that consummation of prayer which was employed by the Master, when near to the culmination of his incarnate experience. The will of the Father is the law of heaven. It contains all ideas, thoughts, desires, in the absolute accord which makes heaven. Heaven is wherever the will of the Father is the will of all wills. If there is a place in the skies, on another planet, in space, beneath the seas, in a cave of earth, where the will of the Father is the instinctive rule of all thought and all action, that place is heaven. When we use the word give, a mental receptiveness is induced, a spiritual vacuum, into which omnipresent Substance rushes. The word which names the gift requested, gives outline and character to the infilling Substance. The asking that receives, is a bringing of our lack to the Father, who supplies without fail. “Ask, and it shall be given you.” We open our lives to receive. God rushes in and makes the barren places to blossom and fruit riotously. We think of the loving, opulent Father, until we gain a distinct understanding of what his providing abundance means. Then we ask, and we do receive. It is very simple, very sure. The Father is true to himself, and his truest self is the giving of his nourishing Substance, sufficient to all that we need, supplying all our requests. We must observe by the wording of the Prayer, that it is daily bread, for which we are to ask. In this phrase, as employed by Jesus Christ, is wrapped some of the deepest as well as some of the sweetest relationship between the Father and his children. There is no suggestion of perplexing economics. The all of the Father is ours. We must ask, to give shape to Substance. That is all that there ever can be to winning a million, to maintaining a modest home, to ease of circumstance or to poverty-bitten existence. We receive what we ask. There is no recognition of a future. When we can breathe today for the intake of tomorrow’s oxygen, we may consistently ask today for tomorrow’s bread. This day is God’s unending day; it is the consciousness of God with us. Its moments unroll our needs, and the asking for supply brings the satisfying inrush of Substance. Keep us. Father, instantly conscious of thy withinness. Then we shall not look for tomorrows with their possible needs; we shall feel thee and thy sufficiency, and the physical demand shall be met as promptly as the need appears. Material food is an outward form of Substance, and Substance is the Body of God. The word we speak gives shape and character to Substance. We live not by “bread alone, but by every word that proceedeth out of the mouth of God.” The Father-Mother substantially feeds us, out of its sacred, all-nourishing body. We are to know this; we are to partake purposely of the Body of God, that we may extract from the physical, symbolic food, that inner characteristic of nutriment which shall make it the foundation of the everlasting body of man. Humanity is a unit, not an aggregate of units. The individual is also a unit, as a drop of rain is a unit of the whole volume of water contained by earth. The drop of rain, whether in the sea or in the mist, has the potential shape and nature of a drop. Through the action of physical forces, comparable to aspiration in the human soul, the elements of the drop may be drawn together, but the formed drop returns to the sea. It cannot long retain its freshness. To insure permanent freshness, the whole body of water must return to that state described in Genesis: “There went up a mist from the earth, and watered the whole face of the ground.” To save ourselves, we must do our utmost to arouse all humanity to the knowledge of Divine Oneness, and each individual to the Son of God consciousness. We pray that we may learn how to pray. When this prayer is answered, we pray for our neighbor; then we pray for the world. These prayers are also answered. Ask, and it shall be given. All paths of prayer lead to God. If we begin prayer by asking for mental or temporal gifts, we find that the answer to these requests is followed by a longing for something of which personal and physical good is but a tantalizing hint. Communion with the Father inevitably creates a desire to know him, to possess him. In praying for daily bread, we pray to be fed now by the substance of God’s incorruptible body. The answer to the prayer comes in an understanding of Substance, and in a longing for a closer intimacy with the Father. Our bodies are generously supplied, our souls richly nourished. The good we know we gladly share with the world. Therefore to offer the living bread, even the Christ, to all men, we pray. When an offender against the civil law is forgiven by the state, he is said to be pardoned. His rights as a citizen are restored to him. In the eyes of the law, he is as if he had never transgressed. When the Father forgives us our shortcomings, we become in the eyes of the spiritual law as blameless of the offense as if we had not committed it in the first place. The human mind does not act with the spontaneity and the genuineness of the civil or the spiritual law. It finds it difficult to act as though the offense had never been. Even the official whose pardoning decree sets the prisoner at liberty, may not be exempt from a resentful memory of the past. The feeling of condemnation may be so keen in the community, that the pardoned one must leave his old home, and go forth into a new place, to escape the “jail bird” accusation carried in the minds of those who knew the circumstances. The man is freed technically but not genuinely, and the punishment of the mental condemnation held by his acquaintances is terrible. The omnipotence of God is directed by man. If we bind the mercy of God for another, we bind it for ourselves. If we free it for another, we free it for ourselves. If a neighbor sins, our knowledge of his transgression does not make us partakers of the sin; but if we condemn him for his sin, we make ourselves dispensers and partakers of his punishment. Forgive, as we forgive, is the only prayer for pardon that we can offer with any hope of effectiveness. To deny pardon to another is to keep ourselves in whatever prison the accused one is held. Forgiveness releases the first offender and ourselves at the same time. Forgiveness is a cleansing work. We shall be every whit whole when we have forgiven every offense. There is no other spiritual exercise that is more far-reaching. Genuine forgiveness wipes out every known offense and every unknown offense. To forgive as Jesus Christ forgives, is to clear ourselves before the Divine Law. He was absolutely without blame, yet he was treated with the supreme condemnation. He did only good, yet he had heaped upon him the fullest measure of evil which his generation could devise. He gave life, yet his own life was taken from him. And he forgave everything. He forgave, because of the ignorance of his persecutors; he forgave, even when those who despitefully used him would have scoffed at the need of forgiveness. Because he forgave, he proved his claim as Son of God. He knew his divinity, and he lived his divinity. Had he condemned his judges and his executioners, his body would have remained inert in the grave, where they said that it was dead. Condemnation is the stone at the door of the life sepulcher, and if the imprisoned one concurs in the condemnation, he places the imperial seal of Caesar upon the stone. Jesus Christ lifted the sentence of condemnation for those who tried to be his enemies. In so doing he lifted himself up from the bier, passed out of the tomb, ascended into heaven. “Father, forgive them; for they know not what they do.” This stripped him of every earth-weight. It physically and spiritually gives him eternal consciousness of life, and makes him able to give his life for us, that we through him may be saved. Eternal life through Jesus Christ, comes by doing as he did. His great work, his everlasting triumph, is the perfecting of the spirit of forgiveness. We must forgive the known offense and the unknown offense. We must forgive seventy times seven, seventy times seventy; we must forgive before the offense is committed, so that we shall not receive it into consciousness. We must forgive so thoroughly that we shall never feel an offense in any man’s word or act, in any circumstance or situation. This is the way by which we shall become blameless before God. We come into the earthly association with a mental mixture of the divine and the human. The divine has descended to the plains of the human, there to meet and to sway earth desires and earth conditions. The relationship so entered into, is the result of a natural inclination toward investigation in all fields of possibility. The soul has learned that it is capable of constructing shapes, or forming alliances, and it proceeds to justify the verdict of Omnipotence, “The man is become as one of us. In contacting earth states, the soul also mingles with them. The senses connect transcendental life to descendental desire. They spread a film over vision, and the power to see infallibly is dulled. We dream nobly, aspire supremely, and we achieve divinely. All our days are filled with the glory of a revealing light; our steps are confident. We see clearly; the goal is sure, surpassingly lovely, growing closer with each winged hour of the happy journey. Then—the film shuts out the landmarks and the lofty height toward which we point our trail. We know not how to direct our steps. The mountain is not high enough to pierce above the film, not luminous enough to shine through it. Then it is that we call for our Guide, the Intelligence which Jesus Christ names the Father. We reach forth a hand to grasp a tangibility in the midst of intangibilities, and lo! the hand is taken into a clasp that reassures and comforts. The One invincible walks by our side, the One before whose eyes the film never passes. Our Father brings us. Never does our hand slip from that sure clasp. Though the way be rough, and filled with dread of what may lurk in the gloom of the film, still truly, securely, ever forward, though to us the path may seem tortuous, on and on, the Father presses as fast as our strength warrants. If the feet of inexperience slip on the rough stones along the unfamiliar way; if, despite the hold of the Hand, we become affrighted; if the unknown looms through the film in terror-waking guise, we call. And the Father takes us up into his arms. He speaks soothingly. He hushes our fearful sobs. He dries our hot tears. He holds us on his breast of love, that throbs in a infinitely tender sympathy with our every need. Then the agony departs, and we are comforted and made at peace. If it could be that we might dissever ourselves from Him in whom we have both life and individuality, we would return to the precreation state of an undifferentiated existence. But the radiance cannot separate itself from the flame which makes it, nor can man disrupt the union between himself and That which radiates itself as Man. Bring us not into temptation, but DELIVER US from the evil. A political kingdom may be taken from its legal ruler, but the spiritual kingdom of the Father is his forever. The power of a political king may be wholly destroyed. The glory of a great ruler may be blotted out, and the lauded, courted monarch may become a despised outcast. But no decrease of power can interrupt the reign of our Father-King. As it was in the beginning, is now and ever shall be, world without end, the King sways the lives of men and turns earthly empires to his wishes. From tiniest mote in the sunbeam to marshaled worlds, the peopled aeons of his universe eternal, keep rythmic step with his immutable purposes. The genius of man is a testimonial to his power, the arch of triumph is the gate uplifted to his praise. The divinest song of man and the chant of the spheres blend in the hymn of his perpetual kingdom. The victory of the Christ over the Adam is a tribute to the glory of the All-glorious. Forever. Not for the passing emotion; not for the brief ecstatic season of conversion, wherein our hearts are exalted in a tender, intense fealty to him, but everlastingly is the King indeed King over us, over all that we see or dare or believe. Not alone in our times of stress does his power sweep compellingly forth and deliver; but when the heart is gay, when mirth diverts, when friends felicitate, and the high hope allures, then is he our ‘joy and our victory. Forever. When the mingled smile and tear give the force and value of applause by which the audience says to the poet. Truly sung, Thine is the glory. When the delivered nation casts the roses upon the path of its hero, and the throng grows frenzied in an excess of gratitude. Thine is the glory. Not ours, not the deliverer’s; Thine, Thine. When eternity consumes time and a redeemed race remembers that which it knew before the sense film had obscured vision; through nightless day and by the steps restored from wandering; forever, forever. Thine is the glory. Kingdom. Power. Glory. Faint imitation of these has man achieved in his somewhat of mastery over space and element, time and death. Dim concept has he of that One through whom he comes into luminance of mind and agelessness of being. Almighty God, King of created and of uncreated things, before whose majesty the heart of Adam faints and soul melts, the never-beginning, the never-ending, the ever Presence and Power of life and domain, is still our Father, eternally our Father. What, then, have we to do? One thing: Pray. Pray as Jesus Christ has taught us to pray. Pray, knowing that the Father takes our prayers as the standard of our requests from him—who denies us nothing. Pray for eminence, for ease, for self-indulgence, if we will; the Father gives us them, that we may learn through disappointment that they are no doors to his kingdom beautiful. Pray we must, and do; night and day, in temptation or in safety, our souls send onward their petitions, and what they ask is found a little forward on the path. The Father must give us what we make ourselves receptacles of. Blame him not for ills. Blame not your brother, even though you think he has mistaught you. Blame not yourself. Pray to the Father, and he will deliver you. His love for you aside, he will do it, because he is bound by his nature to give you the thing which you ask. Pray to him soberly, pray to him rejoicingly. Pray with the heart when the lips are mute. Pray in special need, pray when life is full. Words of prayer are undeviating paths to the Father’s heart. Father, we come to thee, assured that we in thee and thou in us, may be made eternal in our souls, through the union which comes by prayer. We decrease that thou mayest increase. In thy supereminence we find our triumph and our rest. For THINE is the KINGDOM, and the POWER and the GLORY FOR EVER. Amen. Tenth Tracy, Kansas City, Mo.